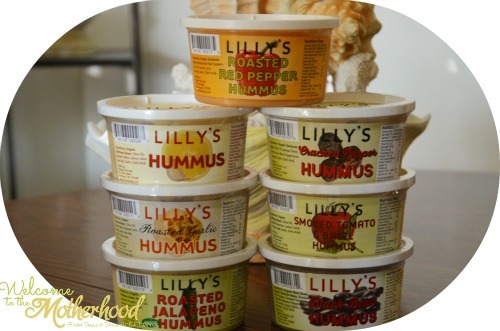 Lilly’s Hummus: All Natural and Gluten-Free! Lilly’s Hummus is an all-natural, small batch, artisan hummus, hand-crafted in eight delicious flavors: Cracked Pepper, Black Bean, Plain (Original), Kalamata Olive, Tomato & Basil, Roasted Garlic, Roasted Red Pepper, and Roasted Jalapeno. Their hummus is made with organic garbanzo beans, roasted with veggies using hazelnut briquettes, locally produced in Portland, Oregon. Last year, I tried hummus for the first time at my wedding reception. Prior to that, I had never tried it, because I never thought it sounded appealing. I was never so wrong! I was immediately hooked. Now, I love hummus on just about anything and with everything – pita sandwiches, pretzels, carrot sticks, bruschetta, salad wraps, you name it. It is a very fulfilling and healthy alternative opposed to dressings and dips. Garbanzo beans (chickpeas), the star ingredient of hummus, is rich in fiber and proteins. It is also rich in tryptophan, an amino acid that’s a precursor to serotonin. Tryptophan is a natural mood lifter. It’s recommended by leading experts to eat foods containing tryptophan in the evening to promote calmness and promote a good night’s sleep. So, it goes without saying that I’m a big fan of hummus. I had the opportunity to sample all of the flavors from Lilly’s Hummus, except for one, the Kalamata Olive. Even though I normally eat Greek salads containing Kalamata Olives, I’ll admit that I’m not a big olive fan – it requires a special taste. All of the other flavors that I did receive were phenomenal. However, I do have my favorites, such as the Roasted Pepper and Roasted Jalapeno. The Roasted Jalapeno was surprisingly not spicy in the least. The “zing” was very, very subtle. Overall, my experience with Lilly’s Hummus was quite enjoyable! They offer high quality hummus that is trans-fat and gluten-free, and made without preservatives. No need to worry about the usage of fillers, imitation flavors, or hydrogenated oils. They believe in simple, basic ingredients that the entire family can enjoy and be nourished by. No wonder why they were recently nominated for a Vegetarian Times Magazine 2013 Foodie Award!